Edmunds.com recently released a list of the top-50 most research vehicles on their car review website. Predictably, Toyota was the brand with the most mentions on the rankings, featuring nine different models. This isn't only an indication that these vehicles aren't only popular, but that they're also dependable and reliable. The popular pickup ranks fourth on the list, topped by a trio of Hondas: the CR-V, the Accord, and the Pilot. The vehicle is also the top truck on the list and, obviously, the top Toyota on the list. Edmunds.com attributes the truck's ranking to the "strong engines, variety of configurations and versatile interior." 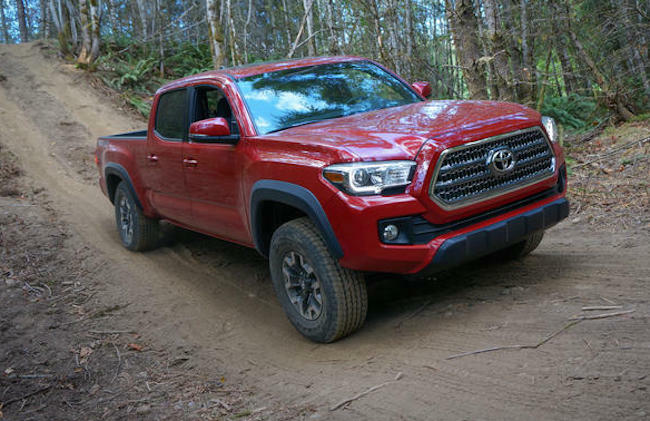 However, the website does note that the Tacoma is one of the company's older designs, and they suggest exploring the brand's other midsize pickup trucks. That engine is certainly impressive, as the 2.7-liter Inline-4 unit can pump out 159 horsepower and 180 ft-lbs of torque. Furthermore, it delivers a 21 city/25 highway mile per gallon fuel efficiency, quite impressive specs for such a large vehicle. The three-row family crossover comes in sixth on the list, with the Mazda CX-5 coming in between the roomy vehicle and the Tacoma. The brand's drastic redesign of the vehicle proved to be successful, as customers were still clearly interested in what the Highlander had to offer. The vehicle is a bit bigger than its predecessors, with a 75.8-inch width, 191.1-inch length, 68.1-inch height and 109.8-inch wheelbase. This results in a boatload of interior room, including 40.7-inches of front head room and 44.2.-inches of front leg room. That roominess applies to the back, as well, where passengers can expects 38.4-inches of leg room and 57.1-inches of hip room. The RAV4 ranks tenth on the list, separated from it's fellow Toyota by the Ford F-150, Honda Civic, and Subaru Outback. Edmunds.com acknowledges that the small crossover doesn't stand out in any particular area, amenity or spec, but the combination of features, passenger space and everyday utility is enough to "warrant a closer look." Among the main features of the all-wheel-drive vehicle includes an in-car entertainment system with an accompanying six-speaker sound system. The engineers included a number of safety features, including stability control (keeps your vehicle upright in harsh weather), traction control (keeps your vehicle and tires stay on the road), a tire pressure monitoring system (allowing you to check the PSI), and a remote security system (allowing you to monitor your vehicle at all times). After the RAV4, we don't get our next Toyota until number-15 on the list, with the Subaru Forester, Lexus RX 350, Ford Mustang and BMW 3 Series standing in the brand's way. The Camry is commended for the improvements to the cabin and the vehicle's overall handling, with Edmunds.com's coining it a "more compelling and competitive midsize sedan" than any of the rivals on the market. Furthermore, the website attributes the vehicle's ranking to the "generous interior space and a solid reputation for reliability." That interior space starts up front, where the driver and front-passenger can appreciate the 41.6-inches of legroom and 54.5-inch of hip room. In the back, passengers can stay comfortable with the 38.9-inches of legroom and 56.6-inches of shoulder room. The reliability could be partially attributed to the 2.5-liter Inline 4 engine, which can deliver 178 horsepower, 170 ft-lbs of torque, and a 25 city/35 highway miles per gallon fuel economy. It takes a while until we get to our next Toyota vehicle... ten spots, in fact! A list of cars separates the 4Runner from the Camry, including the Mazda 3, Nissan Rogue, Jeep Grand Cherokee, Honda HR-V, Ford Explorer, Jeep Cherokee, Subaru XV Crosstrek, Jeep Wrangler and Ford Escape. Edmunds.com notes that the SUV offers better off-roading capabilities than many of its rivals, especially with the specially-made body-on-frame rugged design. However, the website is bullish on the daily driving refinement, questioning the vehicle's handling and driving experience. Only one car separates the brand's vehicles this time around: the Chevy Camaro. The Corolla is the next Toyota on the list at 27th, with the website noting the sedan's "sensible blend of fuel economy, features, versatility and value." The fuel economy is certainly impressive for such a large vehicle, as the 17 city/22 mile per gallon specs are solid compared to the rest of the class. Furthermore, the rear-wheel drive, five-speed shiftable automatic transmission makes for one fun ride (as does the impressive 270 horsepower and 278 ft-lbs of torque via the 4.0-liter engine). Coming in at 32 on the list, the Prius is separated from the Corolla by the Jeep Renegade, Kia Sorento, Chevrolet Colorado and BMW X5. Edmunds says the brand's hybrid car is a "solid all-around choice," although they opine that there are several more enjoyable vehicles to drive. The Prius' best quality has to be the vehicle's incredible fuel economy. The 1.8-liter engine delivers an incredible 51 city/48 highway mile per gallon efficiency, and driver's can expect around a 600-mile range from the hybrid unit. The longest jump between Toyotas is the break between the Pris and Tundra, with the full-size pickup coming in at 46. The vehicle's are separated by the Ford Edge, Acura RDX, Chevrolet Silverado 1500, Mercedes-Benz C-Class, Hyundai Tucson, Acura MDX, Ram 1500, Chevy Equinox, Audi Q5, Lexus NX 200t, Honda Odyssey, BMW X3, and the Hyundai Sonata. The Tundra offers one exclusive feature that many full-size pickups do not: intense off-roading capabilities. It starts with the rear-wheel drive capabilities, which are coupled with a six-speed automatic transmission. The steel wheels and intense P255/70R18 tires will assure that you'll never get stuck, and the 4.6-liter engine (capable of producing 310 horsepower and 327 ft-lbs of torque) will help you get through any terrain. Unfortunately, as Edmunds.com notes, the truck does trail its rivals in many other aspects. The Toyota Sienna immediately follows the Tundra at 47. The popular minivan offers anything a potential customer could ever want, including a spacious and comfortable interior, a reliable, well-built, safe design, and a variety of different trim options. There's a maximum 150 cubic feet of cargo room, and an impressive 39.1 cubic feet of room with all of the seats in the place. The 40.5 inches of front leg room and 37.6 inches of rear leg room certainly helps increase the comfort level, as does a variety of features (including interior air filtration system, a three-zone climate control and a trustworthy cruise control). Buyers can even make their van as stylish as they want by choosing any one of the eight exterior color options (including attitude black metallic and salsa red pearl). The Nissan Murano, Dodge Challenger, and Mercedes Benz E-Class round out the list respectively.